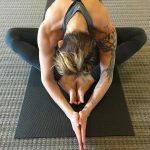 Jessica will lead you for a 60 minute class designed to stretch connective tissue around the major joints (knees, pelvis, sacrum, and spine). This passive practice combines a series of various seated and supine poses typically held for 3 to 5 minutes to access the deep layers of the body. Book your spot here!